We are posting this recording of Lifshe Schaechter-Widman singing Yoyne-hanuvi (Jonah the Prophet) for Yom-Kippur since Maftir Yoyne, the Bible story of Jonah is read during the mincha (afternoon) service. The recording was made by Leybl Kahn in the Bronx in 1954. Two newer interpretations of this song based on LSW’s version have been recorded: the German/USA group Myridian on their recording of 2004 and one by the singer Eleonore Biezunski and her group Yerushe on the CD Yerushe/Heritage in 2016 (you can hear part of the song at this link). This song might have had special meaning for LSW since her father was named “Yoyne.” He died of cholera in 1894 when she was one-year old. His grave is still to be found in the Jewish cemetery of (Yiddish name) Zvinyatchke (aka Zvinyace, Zvineace, Zveniachyn), Ukraine on the Dneister river. The sudden break in the narrative (and melody) from the story of Jonah to a direct appeal to God from the woman singer makes this a very unusual song. I have found no other versions. This recording first appeared on a Global Village Music cassette release of LSW’s songs Az di furst Avek (1986). Upon another listen I have changed a few words in the transcription since that release. The transliteration reflects LSW’s dialect. Yoyne-hanuvi iz fin Got antlofn. Er hot nisht gevolt kayn shlikhes geyn. ven dus shif hot ungehoybn intergeyn. Gevald! Varft men goyrl oys. Veymen me zol in yam araynvarfn. Inter dray misles hot Got bashert a nes. Hobn di yidn gezeyn, vus se iz gesheyn. Azoy zolst mir vazn vi mayn man tsi shpazn. Uptsihitn zekh fin deym toyt. Dus ken nisht keyner, nor di Got eyner. Dus ken nisht keyner, nor Got di eyner. Uptsirateven Yoynen fin deym toyt. He did not want to go on his mission. when the ship started to sink. to determine whom to throw into the sea. Jonah the Prophet of course. In three days God performed a miracle. A fish threw him back out. to save him from death. who rescued Jonah from death. A short ballad or a fragment? In just one verse it tells quite a story and I rather think it is a dramatic one verse song in classic ballad form (first a description of the scene, then a dialogue) about a problem we usually think of as a Jewish immigrant’s dilemma. It clearly was an issue in the old country as well. This recording of Lifshe Schaechter-Widman, (b. Zvinyetchke, Bukovina, 1893 – d. New York, 1973) was recorded by Leybl Kahn in the Bronx in 1954.
iz geshtanen a gevelb afgemakht. Im yon-kiper aza groyse zind? Ikh darf farnern vayb un kind. So they asked – “What are you doing wicked one? This is among the more well-known songs that have been posted on the Yiddish Song of the Week, but I have included it more because of Tsunye Rymer‘s heartfelt singing (as usual! ), than the song itself. He was in his 80s by the time of this recording, but how he expresses the “ay-ay-ays” is a lesson in Yiddish (male) folksinging style. This was recorded in our dining room in the early 1980s, I would guess when Rymer came over Friday night after dinner, as he often did. My mother, Beyle Schaechter-Gottesman is the woman‘s voice, and I hear my father, sister and uncle Mordkhe Schaechter there too. According to Bob Freedman‘s database of recorded songs, particularly of LPs, only Ben Bonus and the Salomon Klezmorim have recorded the song, but it has been quite popular. You can find it with words and music in Chana and Joseph Mlotek‘s collection Pearls of Yiddish Song page 146, 147. Also printed in the earlier collections of Anna Shomer Rothenberg 1928, and Gelbart 1938. As for the performance here: The line is usually sung „nishto keyn matses, nishto keyn vayn‟ since it‘s referring to Passover, so singing „broyt‟ – bread – is a mistake, I will leave to the Yiddish linguists among you to discuss Rymer‘s „hypercorrective‟ pronunciation of „shavous‟ and „sukes‟. 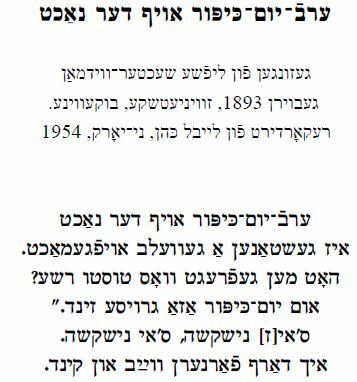 The printed versions all have „Ober khsidim‟ [Hasidim] zenen mir‟ not, as is sung here, „ober yidn zenen mir‟. Since they‘re traveling to the rebbe, Hasidim is the more obvious choice, but in our family we always sang „yidn‟. Listening to this performance, it seems that the version known by the audience sometimes overwhelms Rymer‘s version and he just adapts to our words. Ay,ay, ay, ay! ay, ay, ay, ay! Ikh hob shoyn alts un puter. Hay, hay, hay, hay, hay! un tsim rebn furn mir, undzer gantsn lebn. Ay,ay, ay ay! Ay, ay, ay ay! God in heaven is our father. I have everything and that‘s all we need. Ay, ay, ay, ay! Ay, ay, ay,ay! Ay, ay ay, ay! Ay, ay, ay ay! Ay, ay, ay, ay! Ay, ay, ay ay! Ay, ay, ay, ay! Ay, ay, ay, ay!